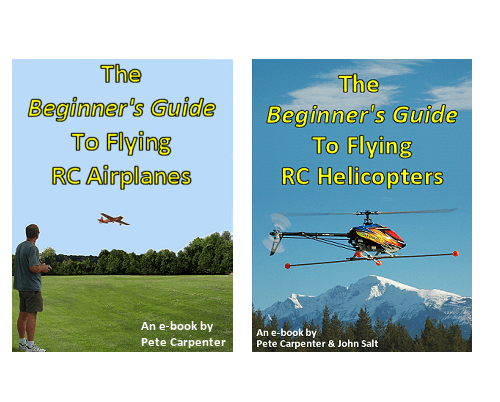 "The Beginner's Guide To Flying RC..."
This RC Beginner's Guides combo deal will save you some valuable dollars off the combined price of Pete's popular ebooks "The Beginner's Guide To Flying RC Airplanes" and "The Beginner's Guide To Flying RC Helicopters", and represents excellent value for anyone looking to get started safely and quickly in the hobby of radio control flying. Price for both ebooks: only $25.00. Crazy! The Beginner's Guide To Flying RC Helicopters. ...but please return to this page and use the Buy Now button for the combo deal, both ebooks for just $25.00 - that's a lot of information for not a lot of money! Each ebook walks you step-by-step through the early stages of learning about your new hobby; you'll get a solid understanding of how radio control airplanes and helicopters work, how the radio systems work and which type of airplane or helicopter you should or shouldn't buy. Comprehensive flight school lessons in each e-book will get you airborne as safely as possible! So to save yourself some money off the price of buying both ebooks individually, please use the button below to grab yourself an absolute bargain. Price for both ebooks: $25.00 Sheer madness!. Your e-mail address is 100% safe - privacy guaranteed. Important purchasing info - please read! These Beginner Guides are ebooks, they are not hard copy books. In other words they are PDF files that you download and save to your computer - please be clear on this before you buy them. You'll need a PDF reader installed on your computer to read them, the most common is Adobe Reader which you can get from here if you don't already have it installed. When you buy the ebooks, you will receive an e-mail from ejunkie which contains a link to the download page. When you download the ebooks, please save them to your hard drive. If you simply open the ebooks and start reading without saving first, you'll lose them when you close the files. If there are any issues with your download, please contact me right away. I live in the UK so please allow for time differences i.e. allow a day or so for me to get back to you.